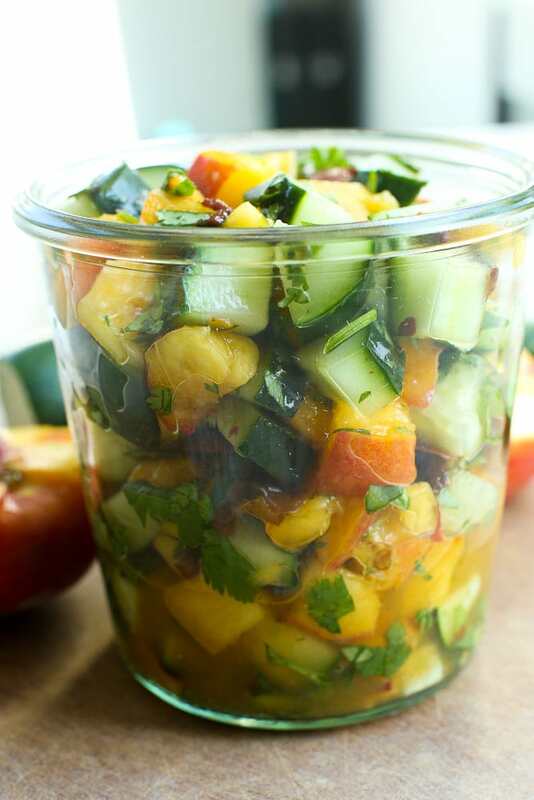 This Cucumber Peach Salsa is a breeze to make and can be a snack, appetizer, or the perfect way to elevate your dinner! 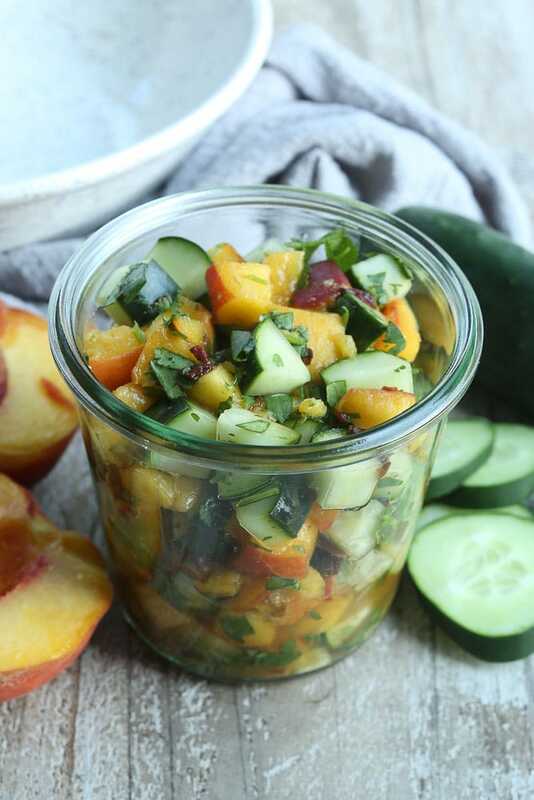 Whether you have a garden that is producing more cucumbers than you can deal with or you have to go to the grocery store to pick some up, you absolutey should make this Cucumber Peach Salsa. It became an instant favorite in my house and I know it’ll be a late-summer staple I make over and over. 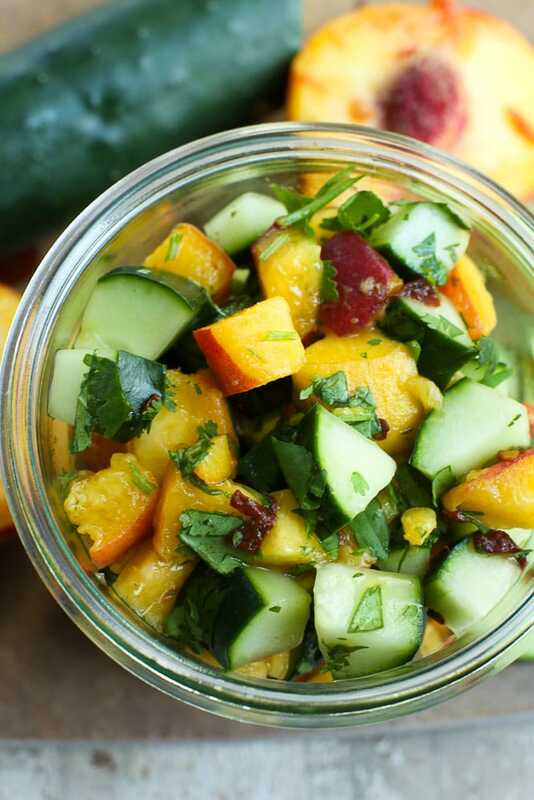 You can use this Cucumber Peach Salsa in so many ways. It’s great as a snack or appetizer with tortilla chips. It will dress up whatever protein you’re having for dinner, from fish like tilapia or halibut, to chicken breasts, to quinoa patties. Use it as a topping for fish tacos night. So many possibilities! I’m in love with both the flavor found in this Cucumber Peach Salsa and the varying textures. The peach makes it sweet, but it’s balanced nicely with lime juice, cilantro, and the cucumber. It has some heat thanks to the addition of a chopped chipotle pepper. SO good! My kids, however, are not into spicy food, so I set a portion aside for them before adding the chipotle. Luke has become my more adventurous eater, telling me he wants to try food from every culture around the world. He’s been very willing to try new things and often likes the new foods he’s trying. This Cucumber Peach Salsa (without the chipotle pepper) ended up being a new food he really liked. If your kids try this, will you let me know what they think? I’d also love to know how you serve this! Take a pic and tag me on Instagram—-> @happyhealthymama I love seeing the recipes you’re making! If time, allow salsa to sit for flavors to develop. Enjoy! *Leave this out if you don’t like a spicy salsa. 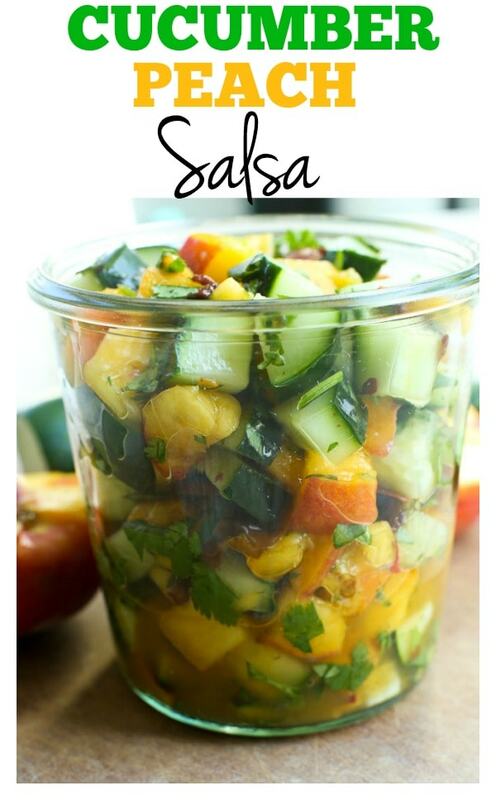 If you try this Cucumber Peach Salsa, would you mind rating the recipe with stars when you leave a comment? It’s VERY helpful for me and other readers if the recipes have ratings and reviews. I appreciate you! If you’d like to save this recipe for later, here’s an image for your Pinterest recipe board! In all my years of extensively eating food, i have never experienced a strong emotional response from my food consuming activities… Until now. For the past 13 years, I have been struggling with inflammation of the earlobe and have visited countless doctors for treatment with no results. 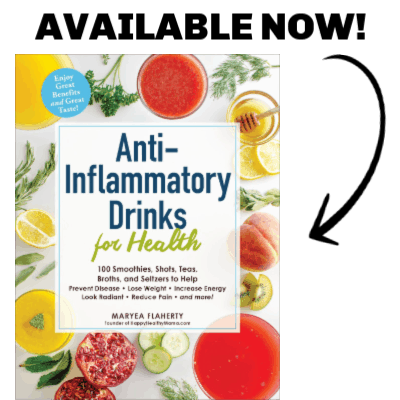 I was both hopeful and cynical when I saw the claims of anti-inflammatory properties of this recipe, as I have tried many “miracle” recipes before that produced no results. As I prepared the dish, I felt a strong electric shock of hope trembling down my spine, and I knew that good things were going to happen. I ate the dish quickly and waited to see if my earlobe inflammation would go down. Every five minutes, I anxiously ran to my bedroom and looked in the mirror, to see if the inflammation was gone. After about five hours of nervously looking at myself in the mirror, I realized that the inflammation had gone! I leapt up into the air, loudly yelling the words “Cucumber peach salsa! I love you!” and fell down to the floor. I stayed on the floor for what seemed like forever, until I realized that the carpet around me was becoming drenched from my river of tears streaming from my face. All these years, looking for a treatment, visiting doctors and taking their toxic big pharma medicine to no avail, and the solution this whole time was simply cucumber peach salsa. I do not think I can put my feelings into words about how thankful I am for this recipe, and how thankful I am for you, Maryea! The food is really nostalgic, thank you for sharing this dish.